In times past, soldiers' dependants were typically left to fend for themselves when it came to healthcare. So few concessions were being made by the military establishment towards maintaining the physical well-being of army wives and children – both on and off the strength – two hundred years ago, for example, that during the Peninsular War (1808–14) many an army child was born and died by the roadside. After 1824, regimental medical officers were permitted to prescribe medicines to army wives and children, but they were entitled to little more. The situation began to change for the better around the time of the Crimean War (1854–56), when such charities as the Central Association in Aid of the Wives and Families of Soldiers Ordered on Active Service provided emergency 'medical attendance' to British-based army families. The Soldiers, Sailors and Airmen Families Association (SSAFA), which was founded in 1885, was at the forefront of the charitable bodies that subsequently provided practical help to forces' families, and 'SSAFA sisters' (district nurses who belonged to the nursing branch set up by SSAFA in 1892) would later become an integral part of British army communities world-wide. The aftermath of the Crimean War similarly saw the institution of organised military general hospitals and healthcare for soldiers, and increasingly for their families, too, especially when posted overseas. And from the start of the twentieth century, the Royal Army Medical Corps (RAMC), the Royal Army Dental Corps (RADC) and the Queen Alexandra's Royal Army Nursing Corps (QARANC) – which today form part of the Army Medical Services (AMS) – and their predecessor organisations, such as the Queen Alexandra's Military Families Nursing Service (QAMFNS), which was set up in 1921, have cared for the health of army personnel and their families, often being based at large British military hospitals (BMHs) overseas. Civilian medical and healthcare professionals have made an important contribution, too. 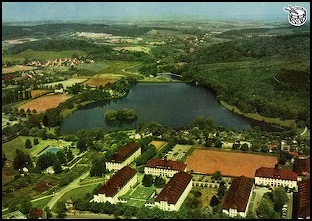 Left: BMH Iserlohn, (West) Germany, where many army children were born during the second half of the twentieth century. This 1960s' postcard shows an aerial view of Iserlohn, which is in the Sauerland region of North Rhine-Westphalia. From 1995, many British military hospitals (BMHs) in England, Germany and elsewhere were closed to cut costs, the treatment of military dependants abroad instead being contracted out to host countries' local hospitals, with SSAFA being charged in 1996 with providing community-health services to British forces in Western Europe. Today, army children whose soldier parents are stationed in the UK are entitled to treatment under the National Health Service (NHS), while those living overseas receive general medical care at military medical centres. TACA occasionally receives queries from former British army children who were born abroad due to a soldier parent's posting asking for advice on how to track down and obtain copies of their birth certificates. In such instances, their births should have been registered with the British authorities through the British Army, and their birth certificates should therefore be applied for through the General Record Office (GRO). If their births were not registered, however, then they can apply for a late registration by contacting the general section at the GRO. For further information on ordering birth certificates, click here; and click here for more on how to register the birth of a baby born abroad. 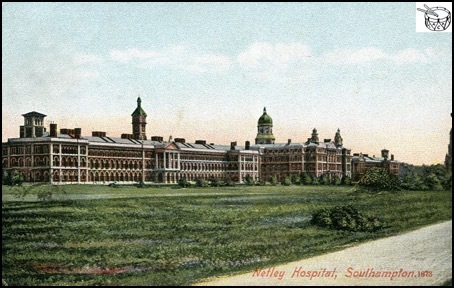 The postcard reproduced below, which was mailed in 1906, shows ‘Netley Hospital, Southampton, 1873’. The Royal Victoria Hospital – Netley Hospital – was established in 1856 initially to care for soldiers wounded in the Crimean War. Julie Green, whose website is devoted to the Royal Victoria Hospital and military cemetery at Netley, observes that subsequently, as well as military personnel, ‘Children were born in the hospital, baptised in the chapel and lived in the hospital grounds or local village with their army families. Some, sadly, are buried in the cemetery after dying from disease mostly, or accidents’. The hospital was demolished in 1966, but visitors can visit its erstwhile site (and the chapel remains as a visitor centre), as well as the associated military cemetery. For more information about the hospital and cemetery, visit Julie’s website: http://www.netley-military-cemetery.co.uk. 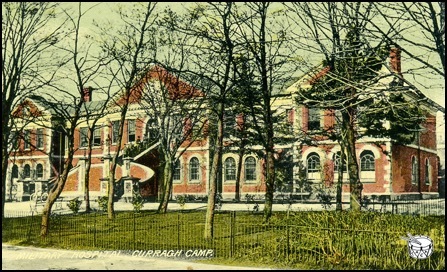 The colour postcard shown below bears the caption ‘Military hospital, Curragh Camp’. Constructed between 1870 and 1900 within the large military camp established during the nineteenth century in County Kildare, Ireland, this hospital was the birthplace of many British army children until 1922, when Curragh Camp was transferred to the Irish Free State. The Buildings of Ireland website gives further details about the building: click here to read more. Jolene has now been in touch to report having found a record of Mervyn’s baptism that states that he was born at Ranikhet on 14 May 1913. Fellow researchers might be interested to know that she located this document within the British India Office Births & Baptisms records’ set on the findmypast.co.uk website. 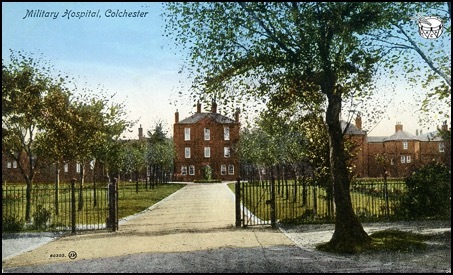 The old colour postcard reproduced below shows the military hospital that was built in Colchester, Essex, in 1896. Numerous army children were subsequently born at the hospital or received medical treatment there. It was closed at the end of 1977, and has since been demolished. 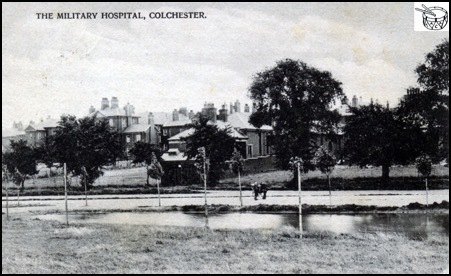 Posted in 1905, the black-and-white postcard below shows Colchester’s military hospital. It would have been around a decade old at this time. 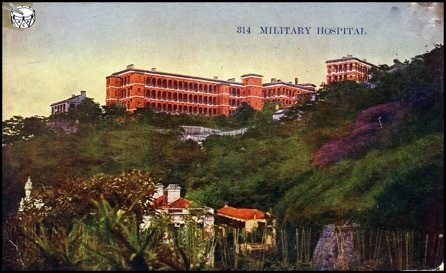 The coloured postcard below dates from around 1907 and shows Shorncliffe Hospital, or the Royal Military Hospital, at Shorncliffe Camp, near Folkestone in Kent. 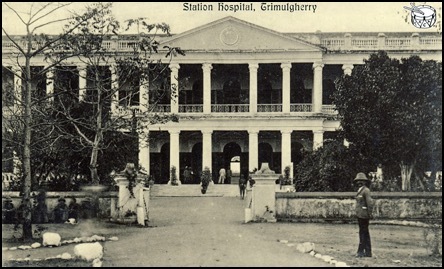 ‘On enquiring into the accommodation provided for women and children, I was informed by the Principal Medical Officer that when he took over charge of the district there was one room only provided for this purpose in the building provided for the accommodation of married non-commissioned officers. This accommodation was inadequate and unsatisfactory. He has since then taken over one of the wooden huts, formerly the Lock Hospital, and has converted a series of rooms into a small hospital for women and children. One patient, a non-commissioned officer’s wife from Dover, was in the hospital at the date of my visit. There were two cots for children and two or three beds for adult patients. There was a separate room arranged as a lying-in room, and this small hospital was in charge of a civilian nurse, recommended by the Sister in charge of the Hospital for Women and Children at Woolwich. The arrangements provided by the Principal Medical Officer are sufficient for temporary purposes only; but everything about this little hospital was clean and well kept. The Principal Medical Officer informed me that he had already spent £120 in arranging this little hospital, the money having been derived from various sources. 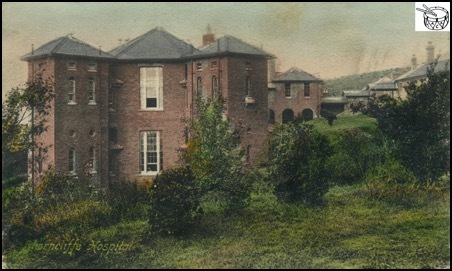 In 1909, Helena Hospital was opened for army families above Battery Point, with many army children subsequently being born and treated there. 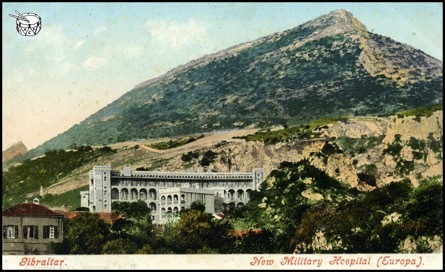 The two old postcards below show British Military Hospital (BMH) Gibraltar, on Gibraltar's Europa Road. 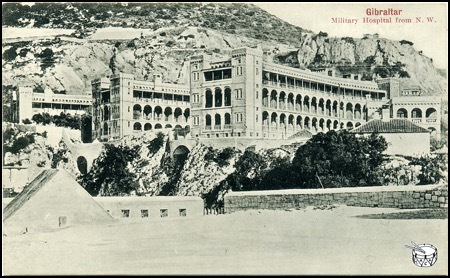 The black-and-white image is captioned 'Gibraltar: Military Hospital from N. W.' (and click here for another view of the hospital, in which Buena Vista School is visible in the foreground). The text beneath the colour photograph reads 'Gibraltar. New Military Hospital (Europa)', and the pale-blue colour that gave the hospital its nickname, 'Wedgwood Castle', is evident here. The message written by an unknown sender on the back of an old colour postcard labelled ‘military hospital’, shown below, reads: ‘Military & Navy have fine places out here & all try for high positions to get a good breeze’. 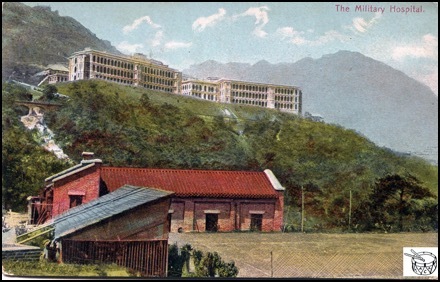 The hospital pictured above and below is the British Military Hospital (BMH) Bowen Road, Hong Kong, which began treating patients in 1907. Situated as it is in the Mid-Levels district of Hong Kong Island, it was once necessary to transport patients there from the lower levels by sedan chair. After World War II, the BMH was responsible for treating the families of British service personnel, and many army children were born within its walls. BMH Bowen Road closed in 1967, when it was replaced by a more modern British military hospital in the King’s Park district, but the buildings later served as school premises and are reportedly still standing. 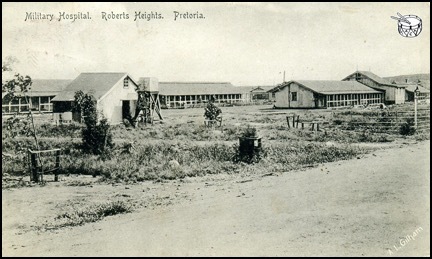 The black-and-white postcard below shows the British military hospital at Roberts Heights, in Pretoria, South Africa, around a century ago. Established as a garrison town following Pretoria's surrender to the British in 1900, during the Second Boer War, or Second Anglo–Boer War (1899–1902), Roberts Heights was named for Field Marshal Lord Frederick Roberts (1832–1914), then commander-in-chief of the British forces in South Africa (and a one-time army child). The 1911 census for England and Wales, which was the first to include British Army soldiers and their dependants on overseas postings, shows that British army families were then living at Roberts Heights. Roberts Heights was later renamed Voortrekkerhoogte, and is today called Thaba Tshwane. Published by the War Office, and dated August 1946 – just over a year after the end of World War II – a booklet entitled Guide to Families Proceeding to B.A.O.R. was issued to army families who were about to embark on accompanied postings to Germany. Areas covered include travel requirements, regulations and instructions (click here to read more); issues relating to pay, allowances, coupons and currency; and a form requesting schoolchildren’s details in order to facilitate their education while in Germany (click here to see it). The extract reproduced below sets out the medical procedures that the families were required to undergo before entering Germany. You and your children must be medically examined to ensure that you are fit to travel to and reside on the Continent and a certificate is needed as you will be asked to produce it when you assemble for embarkation. You will also require to obtain a second medical certificate not more than three days before you embark to the effect that you and your family are free from infectious or contagious disease. Failure to produce this certificate on embarkation may entail medical examination at the port. Owing to the risks of small-pox, typhoid and typhus in GERMANY, you are strongly advised, in your own interests, to be protected against these diseases by vaccination and inoculation before proceeding to GERMANY. If for any reason these preventative measures have been commenced but have not been carried out completely before the family arrives in GERMANY no time should be lost after arrival in completing them. Smallpox. Vaccination or re-vaccination within five years and more than 14 days before embarkation. Typhoid-Paratyphoid. Full immunization (2 doses with 10 days interval) or re-immunization if inoculated more than 9 months previous to embarkation. Typhus. Full immunization (3 doses with 7 days’ interval) if inoculated more than 9 months previous to embarkation. All children of I month to 12 months should be protected against small-pox. All children of I year to 2 years should be protected against small-pox and diphtheria. All children of 2 years and above should be protected against small-pox, diphtheria, typhus and enteric group fevers (T.A.B. [typhoid-paratyphoid A and B]). At the present time there is a good deal of serious diphtheria on the Continent which affects adults as well as children. All adults up to the age of thirty are, therefore, strongly recommended to have themselves tested by their doctor to see if they are susceptible to this disease (SCHICK test). If the test shows that they are susceptible to diphtheria, immunization should be carried out in the same way as for children. Should you be unable to obtain the necessary immunization before you receive instructions to embark, your departure need not be delayed but you should take steps immediately upon your arrival in Germany to have the necessary vaccination and inoculation effected. To this end you should obtain certificates as to vaccination or inoculation received before departure and indicating the dates upon which it was given. 3. How to get it all done. Medical examination, vaccination and inoculation will be done free of charge at any military establishment by R.A.M.C. [Royal Army Military Corps] doctors or civilian medical practitioners appointed for attendance on the troops. You can also obtain vaccination under arrangements made by the local Medical Officer of Health to whom application should be made if desired. Where you are unable to avail yourself of these facilities, arrangements should be made to have the immunization carried out by your own medical practitioner to whom vaccines will be supplied free of charge on application. Any fees incurred must, in such cases be paid by you. 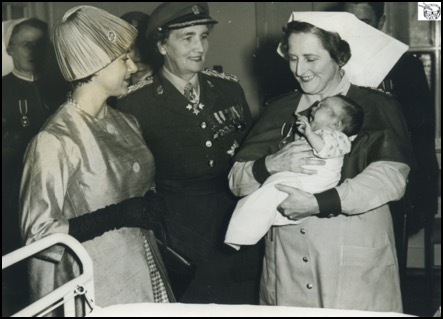 Wherever they have lived in the world, post-war army children have been born and treated at British military hospitals. Three sides of a Christmas card sent in December 1947 are shown below. 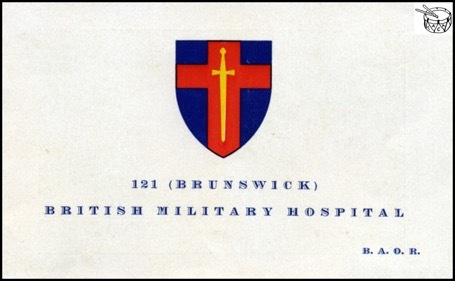 Produced for those connected with 121 (Brunswick) British Military Hospital (BMH), British Army on the Rhine (BAOR), the shield symbolises BAOR, while the photograph on the inner side of the card shows the BMH at Brunwick (Braunschweig), in Lower Saxony, Germany. 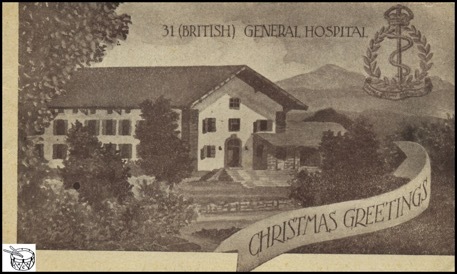 The card below was sent in the same year from someone working at 31 (British) General Hospital in Lendorf, Austria. To the right of the view of the hospital is the Royal Army Medical Corps (RAMC) cap badge. The mentions of the British military hospitals (BMHs) in (West) Germany (Iserlohn, Berlin, Hannover (Hanover), Rinteln, Hamburg, Hostert and Münster) in 'RECENT RESEARCH: 'BORN ABROAD' STATISTICS' prompted Peter Watson to contact TACA with the following observations. 'In addition to the ones you mentioned, there were BMHs in Oldenburg (north-west of Bremen) and Wuppertal in the early years of BAOR. BMH Iserlohn replaced Wuppertal in the 1950s and closed in the early '70s, with facilities for military personnel and their families being concentrated on BMH Münster. BMH Rinteln was originally sponsored by the RAF, but switched to the army when JHQ Rheindahlen opened in the mid-'50s and RAF Hospital Wegberg was created to provide appropriate facilities for both the army and RAF in the area. There was a small RAF hospital on the island of Sylt (close to the Danish border), which could also be used by army dependants living in the northern half of Schleswig-Holstein.' He furthermore suggests that RAF Hospital Rostrop may have taken over from BMH Oldenburg during the mid-1950s: 'Rostrop is a small village in north-western Germany near to Bad Zwischenahn, north-west of Bremen; there were three RAF stations in the area – Jever, Ahlhorn and Nordhorn – and Oldenburg is not far away. The hospital might have opened in 1953 and closed in '55/'56; it could therefore have replaced BMH Oldenburg and would have closed when the RAF assets/facilities moved south to the new airfields in the Rheindahlen area'. Peter adds: 'BMH Hostert would have replaced BMH Wuppertal and was itself replaced by RAF Hospital Wegberg'. 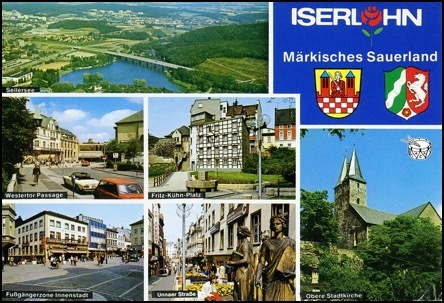 The postcard below, which shows views of Iserlohn, was mailed in 1981, when the German town in North Rhine-Westphalia was home to British Military Hospital (BMH) Iserlohn. Housed in Argonne Barracks from the immediate aftermath of World War II until its closure in 1994, there is more information about BMH Iserlohn on the Qaranc website. ‘Since the 1950s, several hundred children of members of the Canadian and British armed forces came into the world at BMH Iserlohn. 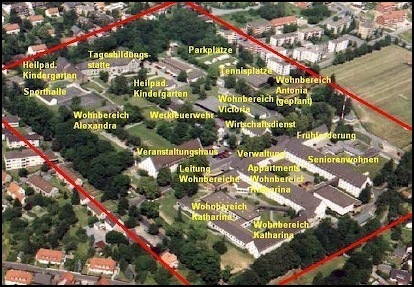 Their parents were stationed at nearby bases and lived in Iserlohn and the surrounding towns such as Hemer, Deilinghofen, Soest, Werl, Senden or Dülmen. It was officially closed in 1994. The website also reports that erstwhile BMH buildings are now home to a boarding school and a business and information-technology school. 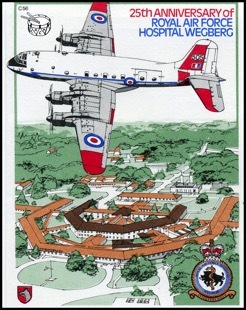 The image below is taken from a first-day cover issued on 31 May 1978 commemorating the twenty-fifth anniversary of the establishment of the Royal Air Force (RAF) Hospital Wegberg, in (West) Germany. The hospital is pictured beneath a No 70 Squadron Hercules XV 298 aircraft. The following information about RAF Hospital Wegberg is contained within the envelope. A Guide for Families in Germany (including 41 Garrison, Hook of Holland), which was published in May 1954, gives basic advice to army families living in (West) Germany during the 1950s on such issues as food (click here for more), shopping and the NAAFI (click here for additional information), entertainment (and here for further details) and travel (click here to read more). Presented in question-and-answer format, the selection of extracts from the booklet given below outlines aspects of the medical care available to army families. Left: The badge of the Royal Army Medical Corps (RAMC). The well established medical service in this country provides for the needs of families. Medical officers have areas allotted to them, and they are available to give medical advice and treatment to all British personnel in their area. Q1: What medical facitilies [sic] are available? A: The medical officer sets aside certain surgery hours for seeing families. Your unit will give you information of how, where, and when you can see him. The medical officer is a busy man, so please do not call him to visit your quarters if you can go and see him. However, if you consider it necessary to call him to your house, do not hesitate to do so. In some isolated areas the medical authorities at HQ NAG [Headquarters Northern Army Group] have approved certain German hospitals, to which members of British families can be admitted for treatment. Q3: Can I receive dental treatment and can I go to a German dentist? A: Facilities for dental treatment are available, and your unit or medical officer will give you the location of the nearest Dental Centre. You can attend a German dentist who has been chosen by the medical authorities of HQ NORTHAG [Headquarters Northern Army Group] only in those areas where a dental officer is not available. You are not advised to go to a German dentist who has not been nominated by the medical authorities and if you do so, it will be at your own expense. Dental inspection of schoolchildren is carried out periodically and treatment provided accordingly. Q6: Are schoolchildren medically inspected? A: Inspections are carried out regularly by a medical officer with a member of the SSAFA Nursing Service in attendance. It is strongly advised that one of the parents should attend these inspections to receive the advice of the medical officer. Q7: Are there any District Nurses? A: The SSAFA Nursing Service is established throughout Germany and its members are available to give advice and help. They act as district nurses and visit the homes of British families, assist at infant welfare and Ante-Natal Clinics, school inspections, etc. All are state-registered nurses. BAD LIPPSPRINGE, BAD OEYNHAUSEN, BERLIN, BIELEFELD, BRUNSWICK, BUCKEBURG, CELLE, DORTMUND, DUSSELDORF, GUTERSLOH, HAMBURG, HANNOVER, HERFORD, HILDESHEIM, HOHNE, ISERLOHN, LUNEBERG, MINDEN, MUHLHEIM, MUNCHEN-GLADBACH, MUNSTER, NEUMUNSTER, OLDENBURG, OSNABRUCK, VERDEN, WAHN, WUPPERTAL. Q9: Is it necessary to have inoculations and vaccinations? The (West) German town of Rinteln, which is situated on the river Weser in Lower Saxony, was the birthplace of numerous British army children during the second half of the twentieth century. More specifically, they were born at British Military Hospital (BHM) Rinteln between the late 1940s (when it was originally an RAF hospital, RAF Rinteln) until its closure in 1996. Located on Rinteln's Waldkaterallee, the land on which BMH Rinteln once stood has, since 1998, been occupied by Lebenshilfe Rinteln e.V., an organisation that cares for people with disabilities and learning difficulties. For more information on Rinteln, as well as a map (Stadtplan) and access to a webcam trained on the marketplace, visit the town's comprehensive German-language website: http://www.rinteln.de/. 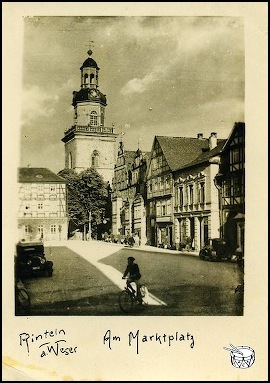 Right: A pre-World War II view of Rinteln's marketplace; the spire of the St. Nikolai-Kirche (Church of St Nicholas) is visible in the background. 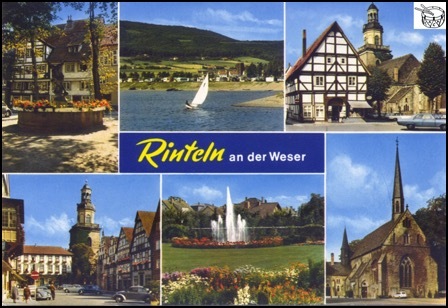 Below: This colour postcard presents six views of Rinteln, the German town on the river Weser where a British military hospital welcomed army children into the world and treated them from the late 1940s until 1996. TACA has received the following request for assistance. If you think that you can help our correspondent, please e-mail newchapters@btinternet.com. If you think that you can help Margaret, please e-mail her at migcutbush@btinternet.com. 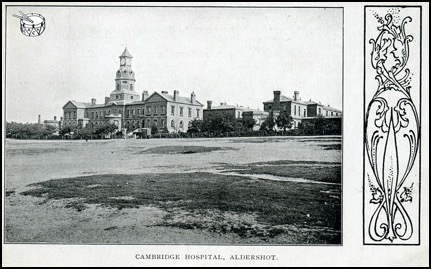 For more information about the Louise Margaret Maternity Hospital, see ‘PICTURE: THE CAMBRIDGE MILITARY HOSPITAL, ALDERSHOT, HAMPSHIRE’, above. The links below relate to various aspects of the types of healthcare provided for army children over the ages. The website of the Soldiers, Sailors, Airmen and Families Association (SSAFA) Forces Help, http://www.ssafa.org.uk, gives further information on the services that this organisation offers, as well as its history. For an in-depth resource devoted to the history of British military nurses, visit Sue Light’s Scarletfinders website: http://www.scarletfinders.co.uk.